Autodesk’s new Smoke 2013 professional video editing software is now shipping. “Autodesk is committed to making high-end effects and 3D increasingly available to a new generation, and the new Smoke is case in point. The Smoke team has fielded thousands of inquiries and product recommendations in the process of developing Smoke 2013. I’m so excited to announce it’s here,” said Mark Strassman, Autodesk Media & Entertainment vice president strategy and marketing. 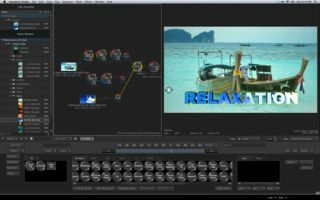 Smoke 2013 is designed to meet the needs of professional editors working in video production, corporate video, online video and other competitive creative environments where productions require editing and effects. The new Smoke offers editing and effects within a single timeline-based workflow, a sleek user interface and runs on a variety of Apple MacBook Pro and Apple iMac computers. Customer research and feedback received during the pre-release trial actively helped drive the product development. New features which grew directly out of user recommendations include: ability to drag and drop a clip from the source player into the timeline; ability to expand/collapse the timeline FX pipeline area; and redesign and streamlining of the UI and interface elements to speed up workflows. Autodesk revamped Smoke to address a growing niche for editors who need to do more than just edit. In a recent survey of over 300 active users of the trial download, over half of which were new to Smoke, many respondents called out the benefits of having an all-in-one package that integrates editing and effects. 51% called out ConnectFX as the top feature. Autodesk Smoke 2013 is now shipping at a price of $3,495 SRP per license.